Bandersnatch, the latest interactive Dystopian Black Mirror experience, was broadcast on Netflix on December 28. FilmFixer manages the film office service for Croydon, Southwark and Islington where filming took place. 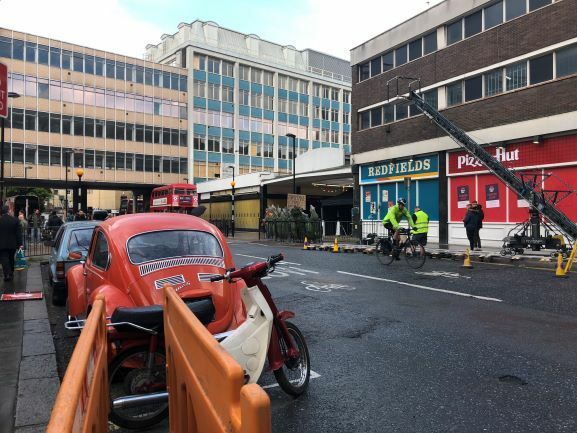 Scenes were shot in Croydon on St Georges Walk, outside Number 1 Croydon, and on the A222 using an old Route Master bus. The crew also filmed in SE1 in Sumner Street inside the Blue Fin Building and then moved on to Islington to shoot scenes at the Finsbury Health Centre. In Islington film unit parking bases were also provided in Finsbury Square, Northampton Road and the Peel Centre. FilmFixer facilitated the filming and kept everything running smoothly especially for local residents. In Islington, residents said that the whole experience was well organised and praised the lack of disruption to residents. The production also made generous donations to Cancer Research (the Mayor of Croydon’s charity) in Croydon and to the Peel Centre, Catherine Griffiths Court and Clerkenwell Tenants Residents Associations in Islington.